Bone Marrow Concentrate (BMC) Therapy, also known as Bone Marrow Aspirate Concentrate (BMAC) Therapy, is a promising cutting-edge regenerative therapy to help accelerate healing in moderate to severe osteoarthritis and tendon injuries. How does BMC therapy work? While similar to Platelet Rich Plasma (PRP) in its ability to harness the body’s ability to heal itself through the aid of growth factors, BMC also utilizes regenerative cells that are contained within a patient’s own bone marrow. The marrow contains a rich reservoir of “pluripotent” stem cells that can be withdrawn from the patient’s hip bone and used for the procedure. Unlike other cells of the body, stem cells are “undifferentiated”, meaning they are able to replicate themselves into various types of tissue. BMC therapy is a promising non-surgical regenerative treatment used to treat various orthopedic injuries, including moderate to severe osteoarthritis and tendon injures. BMC is a concentrate of regenerative stem cells obtained from a patient’s own bone marrow. The physician removes a small amount of the patient’s bone marrow and spins it in a centrifuge in order to generate a powerful concentrate that is injected into the injured area. In the past, these types of cells were often very difficult and expensive to obtain from the body. With recent medical advancements, the cells can be easily obtained and the procedure can be done with minimal discomfort by a simple office procedure. Is removing bone marrow or the injection procedure very painful? While there is some slight discomfort, most patients tolerate the procedure very well and with minimal pain. The procedure is done under local anesthetic to minimize any discomfort. Post-injection soreness at the injection site is sometimes present because of an inflammatory response caused by BMC therapy. This soreness usually resolves on its own within a few days after the injection. It is important that anti-inflammatory medications such as Ibuprofen, Naproxen and Aspirin be avoided following treatments because these medicines may block the effects of the intended healing response facilitated by the post-injection inflammation. It is acceptable to use pain medication such as Tylenol, and in some cases a prescribed pain reliever which does not have anti-inflammatory properties, to control discomfort as needed. Unlike other cells of the body, bone marrow cells are “undifferentiated”, which means they have the ability to replicate themselves into a variety of tissue types. When injury occurs, the usual number of regenerative cells needed for tissue regeneration is often inadequate. With BMC, the concentrate of regenerative cells provides a more robust healing of the damaged tissue and aids in growth and repair by accelerating the body’s natural healing mechanism. While the full benefits of BMC are still unknown, it has been shown to reduce swelling, relieve pain, and enhance healing of articular cartilage and bone. What types of conditions are treated with BMC? Numerous conditions can be considered for treatment with BMC. Based on current research and clinical experience, moderate to severe cases of osteoarthritis and severe tendon injuries show promising results. What is the difference between PRP (Platelet Rich Plasma) and BMC? How is the treatment performed and administered? The process is relatively simple. The area of extraction is locally numbed so no pain is felt. Bone marrow is extracted from the back of the patient’s pelvis or hip bone from an area called the posterior iliac crest. 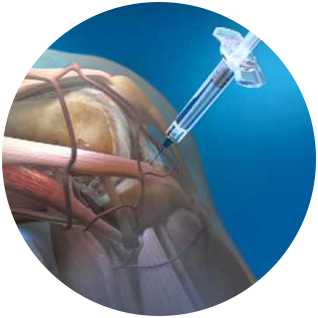 A suctioned syringe attached to a long needle is used to reach the posterior aspect of the hip, during the minimal discomfort is felt due to local anesthetic. The collected sample is transferred through a filter then placed in a centrifuge for spinning. Spinning at a high speed separates the platelets and stem cells from the bone marrow sample. The concentration of stem cells and healing components, collectively known as the bone marrow concentrate, are reintroduced to the injured area under ultrasound guidance. Once introduced at the site of injury, the platelets release growth factors that tell the regenerative cells what to become, thereby initiating the regenerative response. The entire process takes approximately 2 hours and patients go home the same day. Is BMC curative or just a temporary band-aide? No. Unlike cortisone shots which mask symptoms and can damage tissue, BMC targets the root of the problem and attempts to heal the tissue. Most patients require only a single BMC treatment depending on the degree of the injury. However, in challenging cases, if a patient experiences significant relief that plateaus, they may consider a second BMC injection months later. How quickly can I get back to my regular routine? For the first 2-3 days, swelling and discomfort are typical in the injected area. By the end of the first week, these symptoms usually begin to resolve and physical therapy is started to optimize BMC effects and facilitate recovery. Patients have responded to BMC treatment at varying timeframes. Are there any contraindications (i.e. exclusion criteria) that would inhibit someone from getting BMC? Bone marrow derived cancer (such as lymphoma), non-bone marrow derived cancer or metastatic disease (should be checked with your oncologist), and active systemic infection are all contra-indications. Blood thinning medications such as Coumadin must be discontinued and managed appropriately by your cardiologist or primary doctor prior to the procedure. Is BMC covered by Insurance? No. While there are currently several publications in peer-reviewed medical journals showing the positive effects of BMC therapy on tendon, soft tissue, and cartilage injuries, BMC is still not covered by insurance companies at this time. How long does it take BMC to “work”? Most patients notice some level of improvement by 2-6 weeks following BMC. Increased stability and strength are typically reported along with the decrease in pain. A second level of benefits may be obtained between 6 weeks and 3 months. Patients are encouraged to remain active with a functional rehabilitation program and strengthen surrounding muscles during this period.